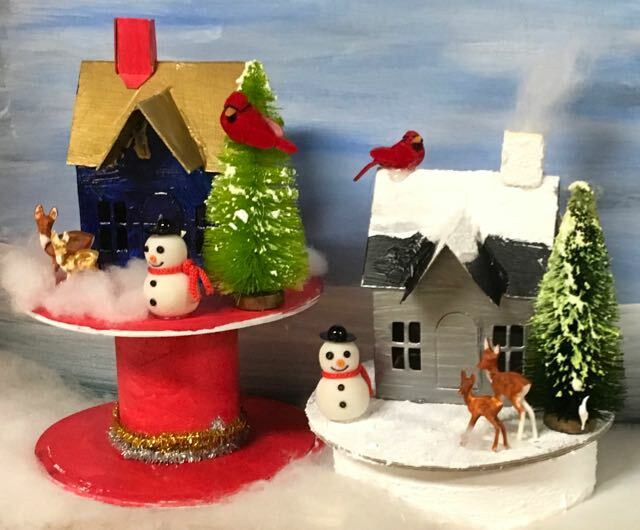 I promised you more incredible creations from the Little House Making Craft Party. All of these lovely little Putz houses are from the second night of the party. 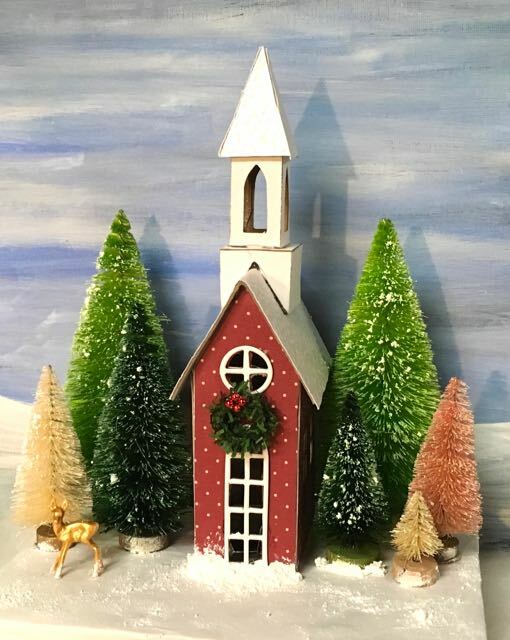 The pretty little church has a wonderful roof and a pretty bottle brush forest. 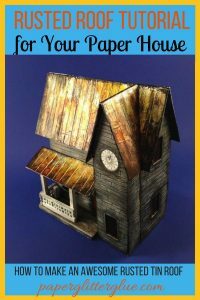 What is remarkable about the house below is how she turned the roof into a metal roof and made such a great forest of trees around her little house. Also she used some garland to make the wreath and painted stepping stones as well. I also like the smattering of snow. Oh yes, and the door. 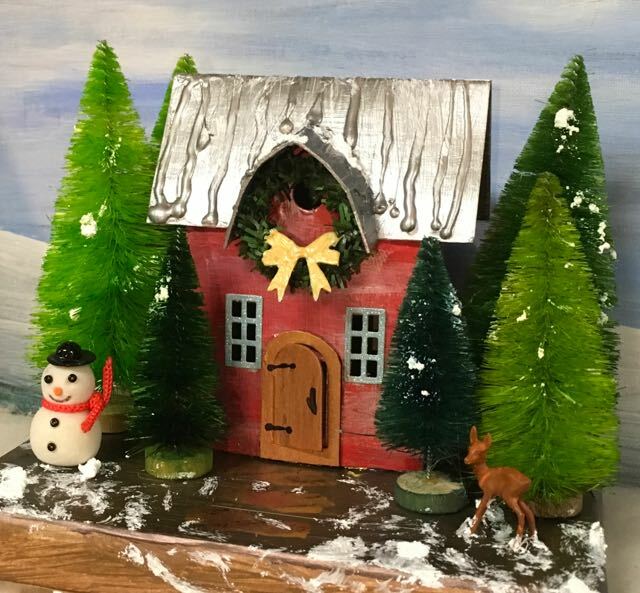 She made a wonderful door for her scene. 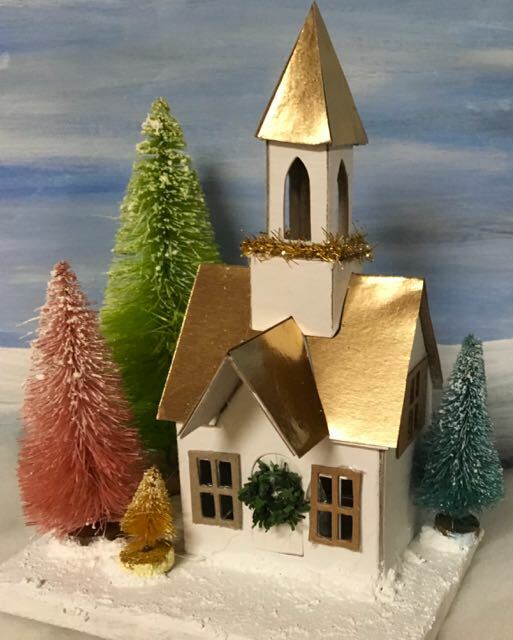 Here I just love the way my friend used the new Sizzix impresslit die cuts to make the roof on this elegant Putz church. And the colors are great too. 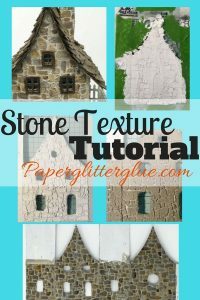 One of my creative friends made this house by cutting out the windows from a piece of scrapbook paper with a stone pattern on it. 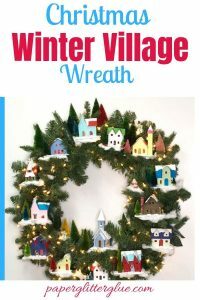 Then she cut out a shingle pattern and landscaped the scene beautifully with tiny bottle brush trees and garland draped around the window. She also made the wonderful little wreath. And to finish it off she decorated a ribbon roll for the base with a woodland scene. I love this little house. 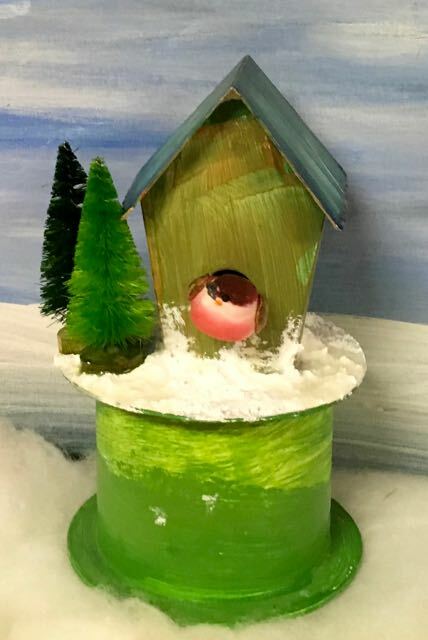 I cannot remember who painted this little bird house, but the green shades are beautiful. 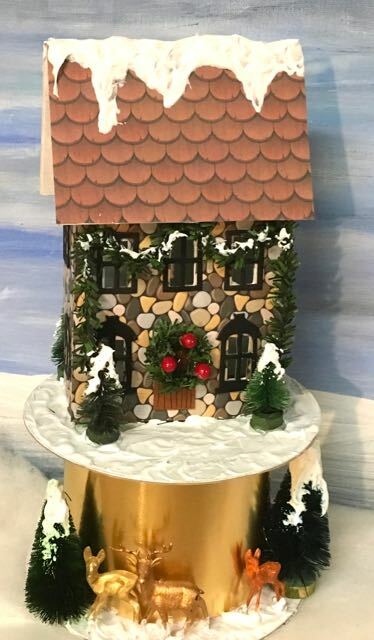 This little house has a ribbon roll base as well. 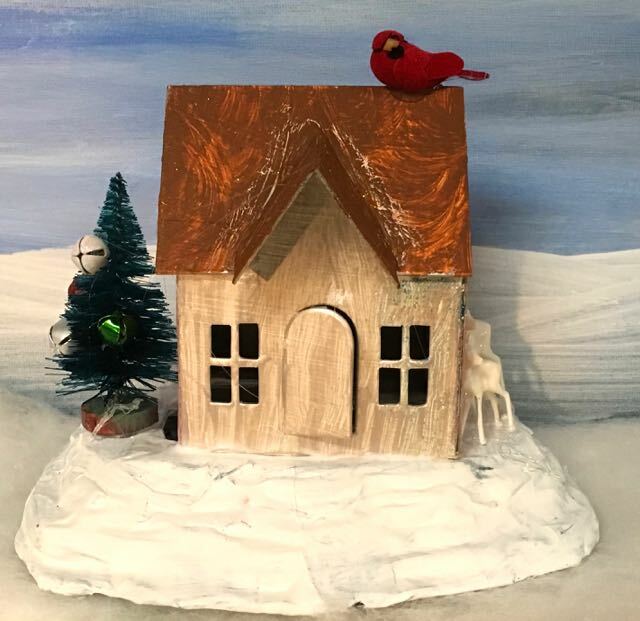 I love the fat little bird in the opening of the bird house. But this is only photo I have of one of the bird houses. 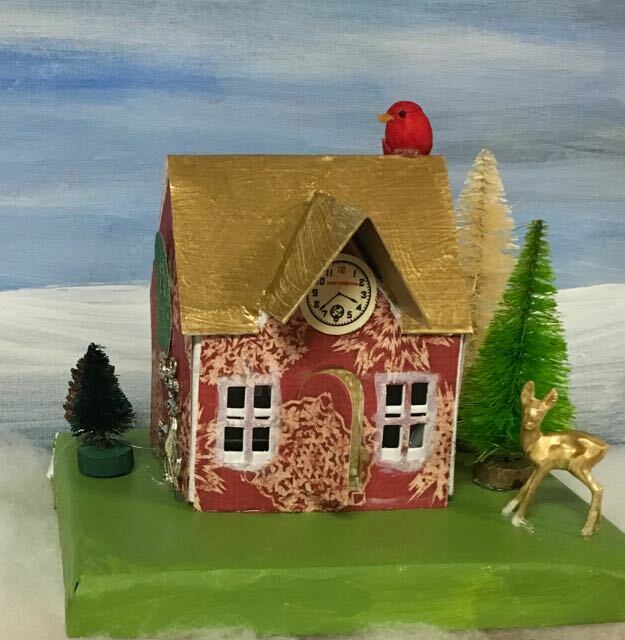 A cute village dwelling house with a gold deer in the front yard and a Merry Christmas Putz clock. Below you see an elegantly simple house. Yesterday I told you that people painted a lot of the roof black. And I had no idea how beautiful it could be for Christmas. What an elegant little house! Another simple house that is very fun though. 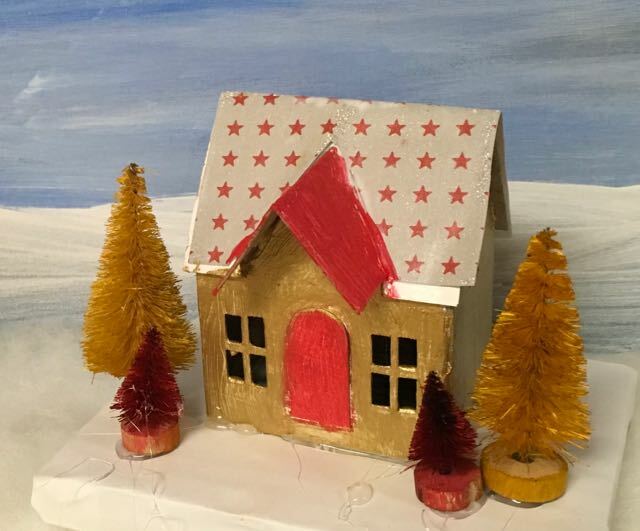 This person (and I think a child made this one) painted the house with paint and then used glitter paint on tip. I love all the creatures surrounding the house. 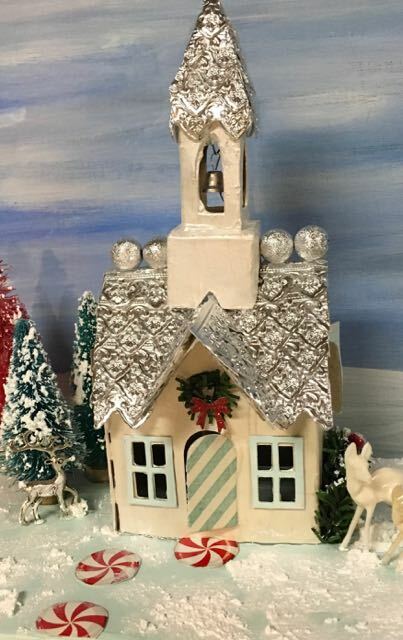 Glitter painted little house with lots of delightful figures surrounding the house. I love the color scheme of this little house. Roof patterns aren’t that easy to cut out. But no one worried if it was perfect or not. That was the great thing. Great color scheme for this little house. 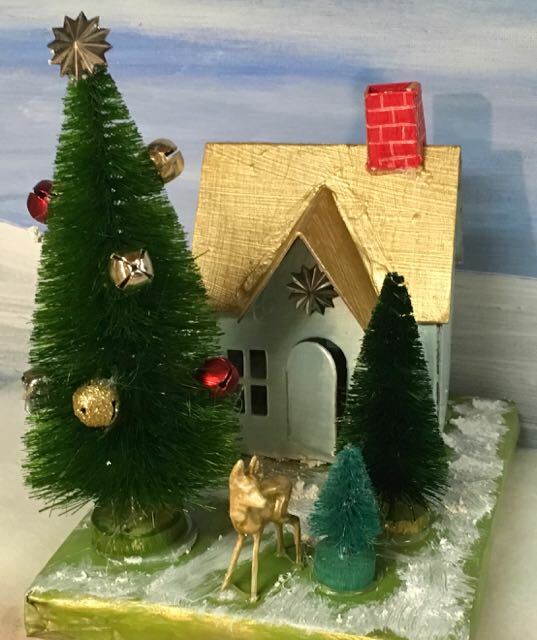 Now I just love the shiny colors and how the little house is nestled behind the trees. What stands out to me on this house is the great landscaping – a little house nestled in the trees. Such a pretty setting for the little church. Once again the ribbon roll bases show off the little houses. 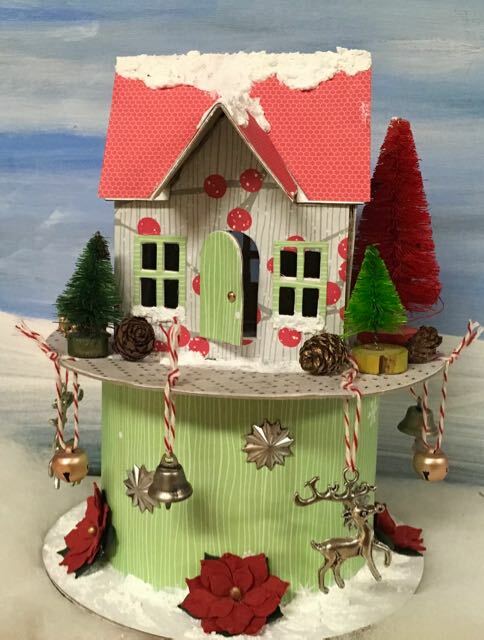 Here’s another little Christmas house on a ribbon roll base. But the maker spent an hour or so dangling charms from the edge of the roll. It’s a great way to decorate the base. Another ribbon roll base with charms hanging down. And finally, just to show you how creative the kids were, here is a diorama one of the kids made. They didn’t just stop at making houses. So those are the photos from the second night of the Little House Making Party. I hope you find them inspiring. Absolutely love all these houses. They will be very inspiration when I start building in January! Didn’t the guests do a great job on all of these houses? I was very impressed with their creativity. 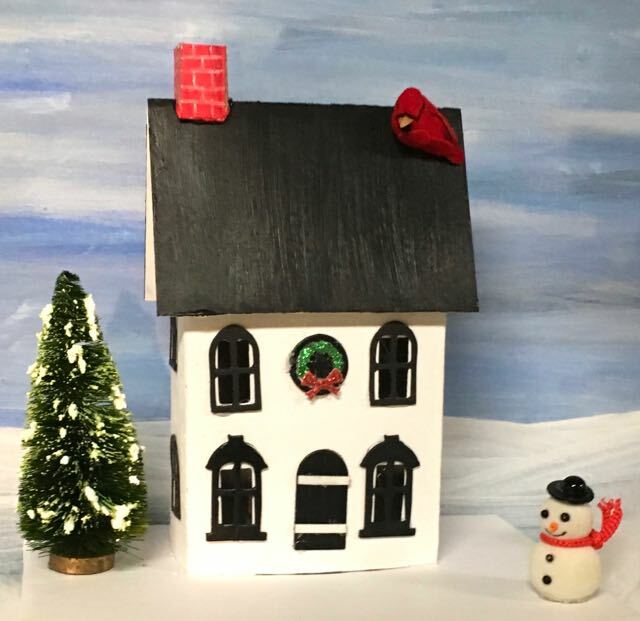 On Monday I start a new series called 12 Houses of Christmas where I post a little house each day for 12 days to fit on a Christmas wreath. That will keep me busy for a few days. So January is when you are going to start building the little houses? I look forward to seeing your projects. I stumbled across your charming houses by accident and am loving them. I plan to create my first house this weekend. My question for all of you is this: How do you store your creations? Cynthia, I am so glad you found the little houses. I love the little houses, but even more I love to MAKE the little houses so I had to figure out what to do with them. My solution is to sell them for a charity. It’s hard to make enough money for the time you put in making the houses when you sell them, so I donate the money to Habitat. In other words, I try not to store the houses. I think most people store them in boxes when they are not on display. I’m in rural northern England and just getting started on little houses. 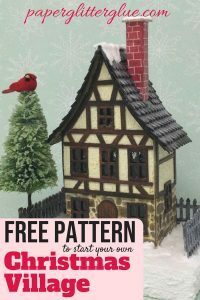 I’ve always loved little buildings but not really made them before, although I am a prolific needleworker and crafter. I’ve been collecting all kinds of cardboard, and paper and bits for decorating the houses. 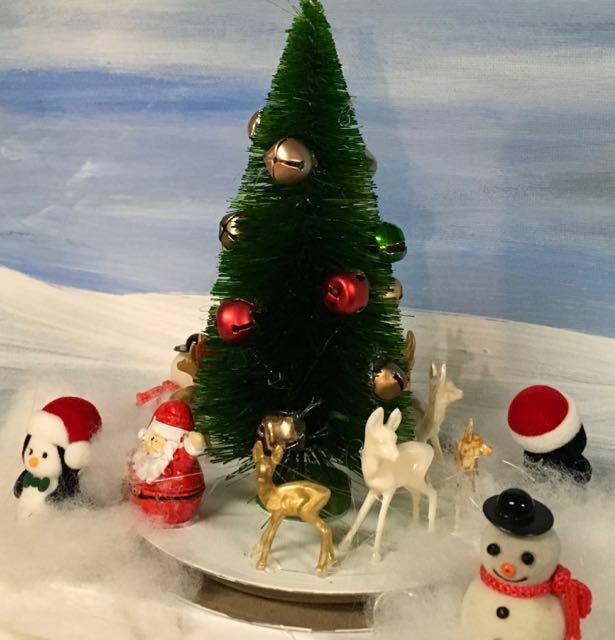 But I cannot find the little deer figures anywhere online and though the nearest craft supplies shop had bottlebrush trees, it quickly sold out of them, and didn’t have any little figures or animals. 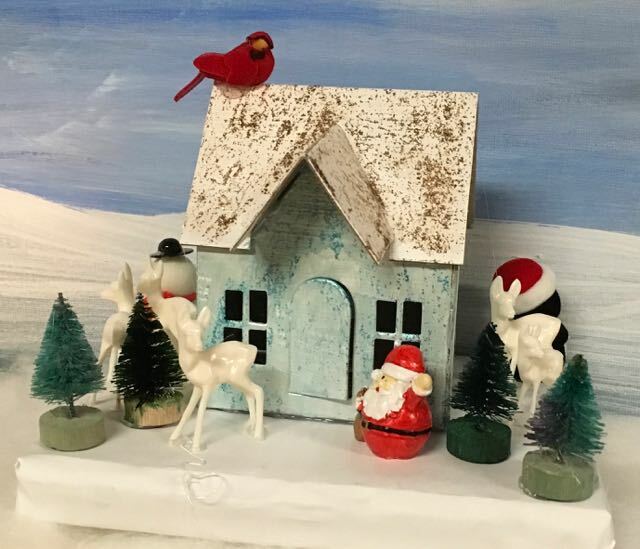 The little deer figures are kind of a specialty item that you see the mostly around Christmas time. Here’s an Amazon link to the little deer. But you can sometimes find them on Etsy under vintage miniature deer figures or something like that.